China Aviation Supplies Holding Company has signed with Airbus a General Terms Agreement for the purchase of a total of 140 aircraft. The agreement comprises of 100 A320 Family aircraft and 40 A350 XWB Family aircraft, reflecting the strong demand of Chinese airlines in all market segments including domestic, low cost, regional and international long haul. The agreement was signed in Berlin by Tom Enders, Airbus CEO, and Sun Bo, Executive Vice President of CAS, in the presence of visiting Chinese President Xi Jinping and German Chancellor Angela Merkel. The Airbus A350. Wings for Airbus aircraft are made in the UK and Rolls Royce produces the XWB engines in Derby / Picture: Airbus. The world’s passenger aircraft fleet above 100 seats is set to more than double in the next 20 years to over 40,000 planes as traffic is forecast to grow at 4.4 percent per year. Emerging markets such as China continue to be an engine for growth, with domestic traffic to become the world’s largest market, according to Airbus’ latest Global Market Forecast 2017-2036. By the end of May 2017, the in-service Airbus fleet with Chinese operators totaled some 1,440 aircraft, of which nearly 1,230 are A320 Family planes. 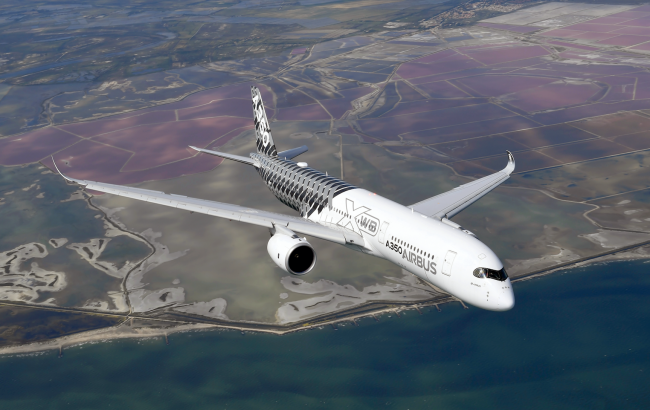 The A350 XWB has received valuable endorsements from several Chinese customers. The unrivalled operational performance and cabin comfort of the A350 XWB will give Chinese airlines a competitive edge to attract more passengers on international routes. The A320 Family is the world’s best-selling single aisle product line. To date, the Family has won over 13,000 orders and more than 7,600 aircraft have been delivered to some 400 customers and operators worldwide. With one aircraft in four sizes (A318, A319, A320 and A321), the A320 Family seats from 100 to 240 passengers. The Family features the widest cabin in the single aisle market with 18” wide seats in Economy as standard. The A350 features the latest aerodynamic design and materials, including its carbon-fibre fuselage and wings. It is powered by new fuel-efficient Rolls-Royce Trent XWB engines. Together, these advanced technological features translate into unrivalled levels of operational efficiency, with a 25 per cent reduction in fuel burn and emissions in addition to significantly lower maintenance costs.